There is something about woven wicker swings that makes them so endearing. They make you just want to curl up on one of them with your hot cocoa and banging playlist and escape for a while. The Art to Real Porch Swing Chair has this same design. As far as aesthetics go, it hits all the right spots with the classy vintage appeal that all wicker porch swings possess. But is it all easy-on-the-eyes no function? Below is a review to help you find out. The frame is made of high quality aluminum. The screws are made from rust-resistant stainless steel. The seat features a breathable woven wicker design. It has a maximum weight capacity of 350 pounds. 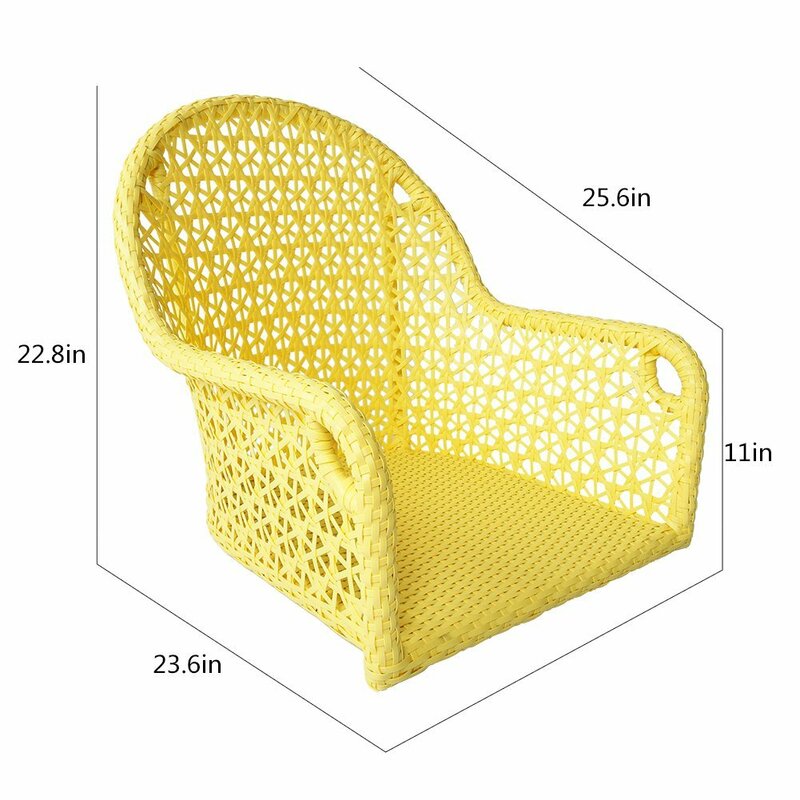 The wicker material is coated with a UV resistant protective layer. It comes with strong woven fiber ropes for setup. 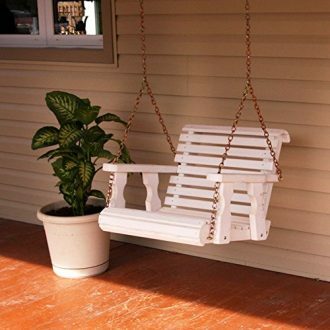 When it comes to porch swings, the value of a high backrest cannot be emphasized enough. This is what offers you the support you need to stay comfortable on the swing for hours on end. 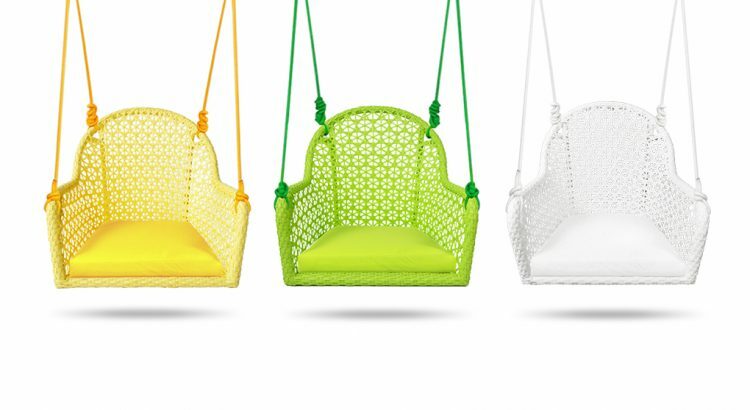 This Art to Real swing chair does not disappoint with its high back part and straight seat. These ensure that you sink effortlessly into the most comfortable possible position on the chair. This is only available on the base of the chair. The padding is for comfort ensuring that you don’t have to suffer the discomfort of sitting on the swing’s hard frame or woven fabric. The seat measures 22 inches in length and 23.6 inches in width. This makes it a pretty roomy seat for you to comfortably move around in. Another great thing about this deep seat design is the fact that it gives you the freedom to add more pillows and cushions if you want to. This ensures that the one person it can accommodate has great experience on the seat. They can move around, place their feet on the chair or even curl up to more comfortable sitting positions. The ability to add cushions and things like throws without crowding the space is also a perk to this spacious design. For the sake of aesthetics, you have a lot to choose from in terms of color. 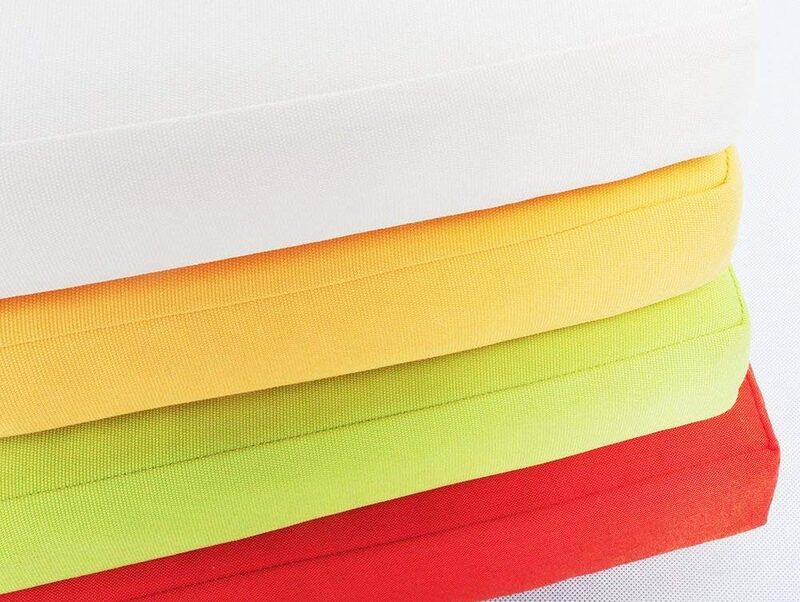 It comes in white, red, yellow and green. This gives you variety to choose from based on personal preferences or existing outdoor décor themes. The colors also complement the wicker design for a lively and vibrant effect. 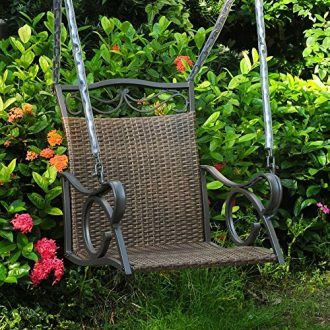 Unlike many other swings on the market, this one only comes with the chair and some support ropes. All you have to do is find a strong, horizontal and high-set surface from which to set up your swing. It could be anything from a tree to your front porch ceiling beams. The setup process is way easier than what you have to go through with complex frame and base swing designs. The wicker fabric is coated with weather resistant material. This makes it both waterproof and UV resistant. The cushions covers are also waterproof with sealed zippers to prevent any water from sneaking in. The only one con to this swing design is the fact that it limits you in terms of where you can set it up. There needs to be the aforementioned support structure. This means that without a tree around or a front porch with exposed beams you might have trouble finding a place to set up. Here you can have a look at the best suspension sets we recommend. This unique chair features handmade wooden seats. The wood used is pine for the perfect combination of simple aesthetics and practical functionality. Pine is strong and durable yet soft and very comfortable to sit on. 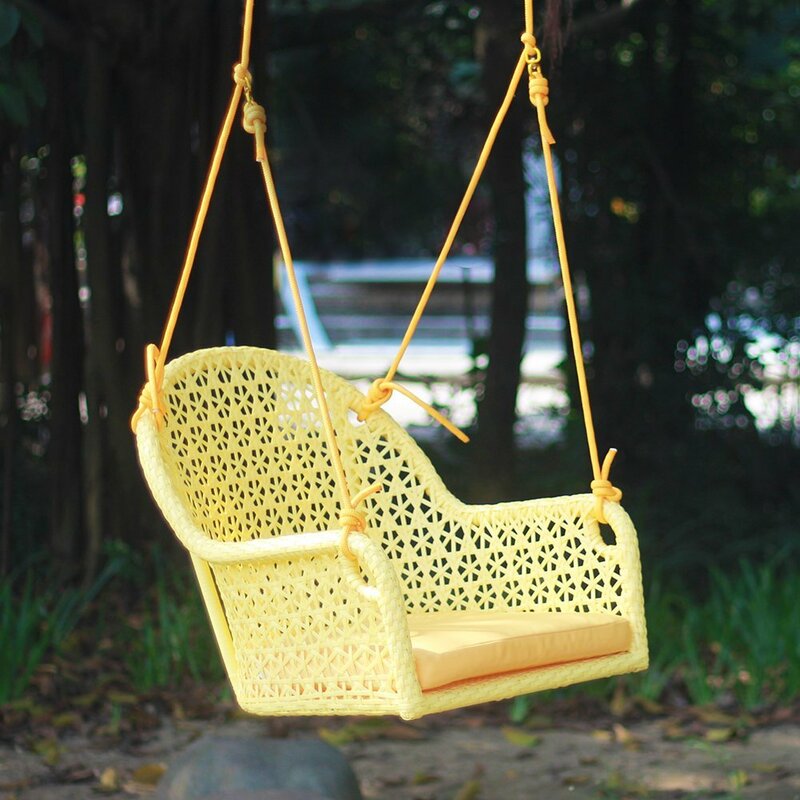 The swing chair is covered with a protective layer of ecofriendly coating for increased durability. This protects it from mechanical damage including chipping and paint stripping. The swing is hand from suspended structures as with the Art to Real model. However, it uses chains that are significantly stronger. It has a 500 pound weight capacity and can seat 2 people comfortably at ones. The main disadvantage is the non-cushioned nature of the sitting surface. This makes using the swing for too long an uncomfortable experience. As with the Art to Real model, there is also the aspect of limited setup options. It is, however, a great option if you want that traditional and rustic looking wooden swing aesthetic effect. This is a one-person woven wicker seat. Unlike the Art to Real chair, it does not have a cushion which could make it uncomfortable. It is also smaller in terms of sitting space dimensions especially when it comes to the width, which again affects comfort. It is, however, weatherproof with PVC resin coating on the wicker fabric protecting it from UV rays and damage by water. So, is the Art to Real Porch swing a good choice? The answer is yes, if you are looking for something simple and spacious with the woven wicker look. The other comfort features, as well as the superior construction and great aesthetics, also make it a great investment. Just make sure to identify the setup location before you make your purchase.